For those of you who are following the business to business (B2B) world of social media, there is a new player in town that I am very excited about! 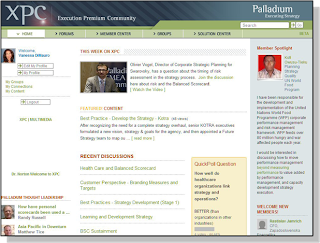 My client, Palladium Group, just announced that they have launched a global online community for strategy practitioners called the Executive Premium Community or XPC for short. As the Palladium brand is so strong and respected – the creators of the Balanced Scorecard methodology, led by the famous Doctors Norton and Kaplan, and offering the whole enchilada of best practice, we needed to make sure this community would serve the Palladium brand and more importantly the clients well. So there were a number of things we did to ensure its success and here is our story …. First, we talked to clients – lots of them – to find out what they needed get from the community and also from interacting with each other through in-depth interviews and surveys. Never once did we “tool talk” with potential members especially because of their seniority, they focus was on getting access to people and information to serve their work within companies so that is where we focused. These professionals are often isolated practitioners within enterprise and needed a platform to share their ideas, exchange experiences and form connections around the world. Second, we focused many months of strategic planning effort on how we can best serve the membership base – what can we give them that will delight them and more importantly, make them want to log in frequently and engage with each other. Offering two levels of membership – free and platinum level (for a fee) and a sponsorship model we ensured sustainability to financially support growing the community features over time. Third, we tapped into a wealth of amazing content – from conference presentations, videos, interviews, papers and created an enormous library of best practice so they no matter what stage the member was in in her experience as a strategy worker, there was something of value. The design focused on a clean and easy to use interface – as we were aware that executives don’t have a lot of patience with new-fangled technology and kept it the streamlined. We used Awareness Networks for the platform and they were fast and easy to work with. And, we trained internal thought leaders on how to best use social media to help their clients and provide leadership online. Through a series of “Thought Leader” training sessions we taught people about the rules of engagement online – be social, share your wisdom, be especially responsive and the importance of asking good questions. And finally, we spent three months in beta refining the site – and worked with a dedicated group of 300 active foundation members in order to have them test drive the site, provide feedback, supporting their ability to contribute user generated content and generally insuring it was were ready for prime time before opening their doors. We now are entooled with a clear member onboarding plan, welcome kits to help guide the newbies, and an elegant member invitation process. This was one amazing journey! Since our formal launch this week the community is growing *really* quickly with members around the world, activity level is very high with the average member spending more than 15 minutes online per visit, and proving to be a valuable contribution to the world of b2b communities. We at Leader Networks are proud to have been a part of the Execution Premium Community (XPC) – here is the press release! Even though the community is “gated” meaning people need to apply to gain access and must be an active practitioner within an organization, here is an online demo).